A senior biology major will walk across the stage early — a year early, after completing her degree in three years. 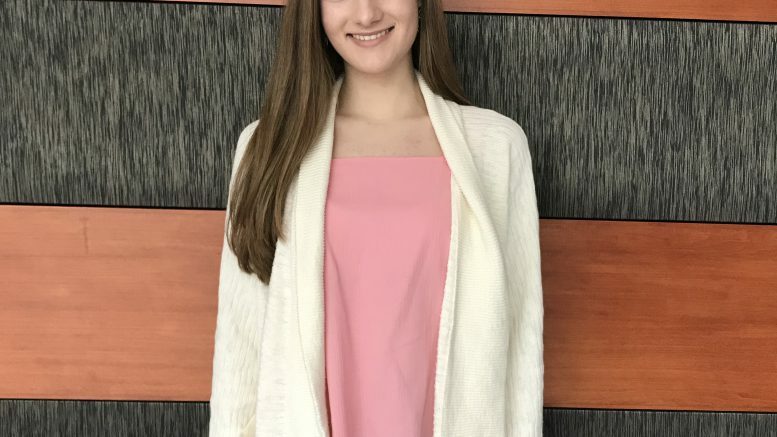 Anastasia initially intended to graduate with the class of 2020, but coming into Lebanon Valley College as a freshman with 31 credits made it possible for her to graduate within three years. After graduating from LVC in May, Bowersox plans to attend Lock Haven University at its Clearfield location for its Physician Assistant’s program. It’s a two-year program that she will start right after graduation. Physician assistants have a lot of the same roles as a doctor and they tend to be the go-between with the doctor. They are able to examine, prescribe and diagnose patients, but everything must be co-signed by the doctor that they are under the supervision of. Bowersox’s first year of Physician Assistant school will consist of mostly didactic work. This includes lecture-style classes that will include book learning in the morning and more hands-on work, like learning how to do examinations in the lab portion. In the summer, she will have the gross anatomy portion. Her second year will be the clinical year, which means she will be in hospitals shadowing PAs in action with actual patients. Around the same time Bowersox decided she would graduate early, she also decided she wanted to be a PA. With the help of her advisors and professors, she successfully figured out how to apply, get letters of recommendation and set up her classes. “I’m really thankful for my professors and advisors here at LVC because I wouldn’t have been able to graduate a year early or apply to a school without their help,” Bowersox, said. Bowersox believes that her overall LVC experience has prepared her well for the next step in her education and she cannot wait for what is in store.